October 9 2016 - Retired Knesset worker and grandmother Levana Malichi, 60, of Jerusalem was shot and killed in a terror attack perpetrated by a Palestinian terrorist near Ammunition Hill in Jerusalem. Malichi was waiting at the Ammunition Hill light rail stop when the terrorist opened fire. She was critically injured in the attack and was evacuated to Jerusalem's Hadassah University Hospital, Mt. Scopus, where she was pronounced dead. 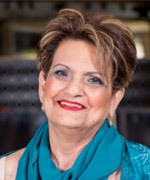 Malichi worked in the Knesset for over 30 years, until her retirement in 2010. Longtime workers in the Knesset said they remembered her as beloved by all, dedicated, caring and modest. Her funeral took place on Sunday (October 9) at the Givat Shaul cemetery. She is survived by her husband, three children and six grandchildren.